BACKGROUND AND PURPOSE: Early CT signs in the deep middle cerebral artery (MCA) territories have been reported to be seen at the initial period of ischemia. We attempted to investigate the incidence of parenchymal hypodensity within 3 hours after ischemic onset among patients with angiographically proved embolic MCA occlusion and to assess the correlation of subtle hypodensity in the deep MCA territories with involvement of the lenticulostriate arteries in the presence of ischemia. METHODS: Fifty CT images obtained within 3 hours after onset of embolic MCA occlusion were retrospectively reviewed by three neurosurgeons who were aware of clinical features. Early CT signs in the deep MCA territories were divided into three grades according to their anatomic location: grade I, normal basal ganglia with hypodensity localized to the insula; grade II, partial obscuration of the posterolateral part of the putamen; and grade III, hypodensity of the entire lentiform nucleus. 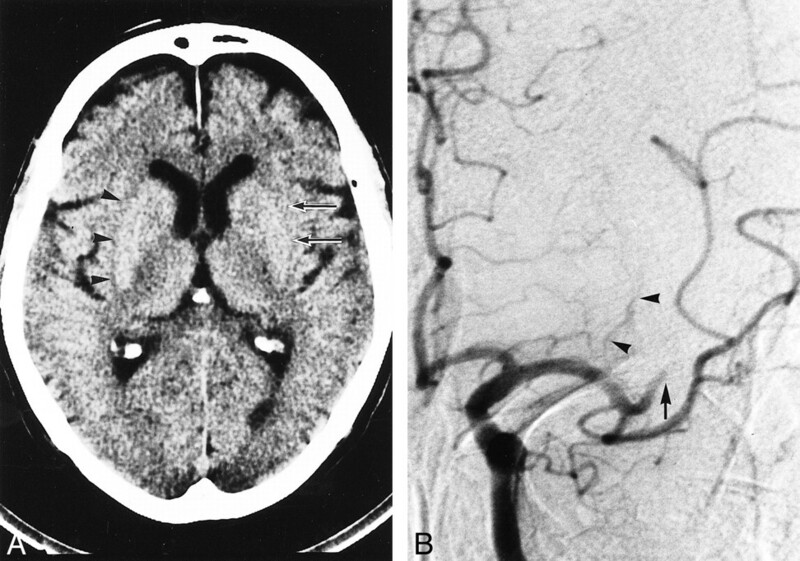 A grade I CT sign was considered to be a negative finding for lenticulostriate artery involvement, whereas grade II and III CT signs were considered to be positive findings. Site of occlusion and involvement of the lenticulostriate arteries were confirmed by angiography. RESULTS: Thirty-eight (76%) of 50 patients had early CT signs in the deep MCA territories. Sensitivity and specificity of a grade I CT sign indicating absence of lenticulostriate artery involvement in ischemia were 65% and 87%, respectively. On the other hand, sensitivity and specificity of grade II and grade III CT signs for presence of lenticulostriate artery involvement in ischemia were 77% and 100%, respectively. Grade II CT signs resulted from various sites of occlusion, whereas grade III was unequivocally predictive of proximal occlusion to all of the lenticulostriate arteries. CONCLUSION: Involvement of the lenticulostriate arteries may be presumed by precise evaluation of subtle, CT-revealed hypodensity in the deep MCA territories, even within 3 hours of ischemic onset. When deciding whether to perform reperfusion therapy for acute middle cerebral artery (MCA) occlusion, it is important to confirm whether the lenticulostriate arteries are involved in ischemia (1–5). Because the lenticulostriate arteries are terminal vessels with poor collaterals, reperfusion therapy for patients with MCA trunk occlusion involving the lenticulostriate arteries may be associated with a high risk of hemorrhagic complications (1, 4, 5). Since site of arterial occlusion cannot be precisely predicted from clinical presentation alone, angiography is usually needed to confirm the exact location of arterial occlusion. However, even without angiography, involvement of the lenticulostriate arteries may be presumed by precise evaluation of subtle, CT-revealed parenchymal hypodensity, such as obscuration of the lentiform nucleus and loss of the insular ribbon. These early CT signs in the deep MCA territories have been reported to be seen as early as 1 hour after symptom onset (6, 7). Sensitivity of CT for these subtle signs has been reported to increase up to 100% during the first 2 hours after symptom onset in patients with angiographically proved MCA trunk occlusion (8). Because they are often seen from such an early period within the present concept of the therapeutic time window, involvement of the lenticulostriate arteries may be detected as the presence of subtle hypodensity in the lentiform nucleus. On the basis of these considerations, we investigated the incidence of parenchymal hypodensity within 3 hours after symptom onset and assessed the correlation of early CT signs in the deep MCA territories with involvement of the lenticulostriate arteries among patients with angiographically proved embolic MCA occlusion. Since 1993, we have performed some reperfusion therapies in 116 patients with acute MCA occlusion. Fifty of these 116 patients underwent initial CT scanning within 3 hours after symptom onset and were selected for this study. Initial CT images of 10-mm section thickness were obtained immediately after patient admission by use of a Quantex RX scanner (Yokogawa Medical Systems, Tokyo, Japan). 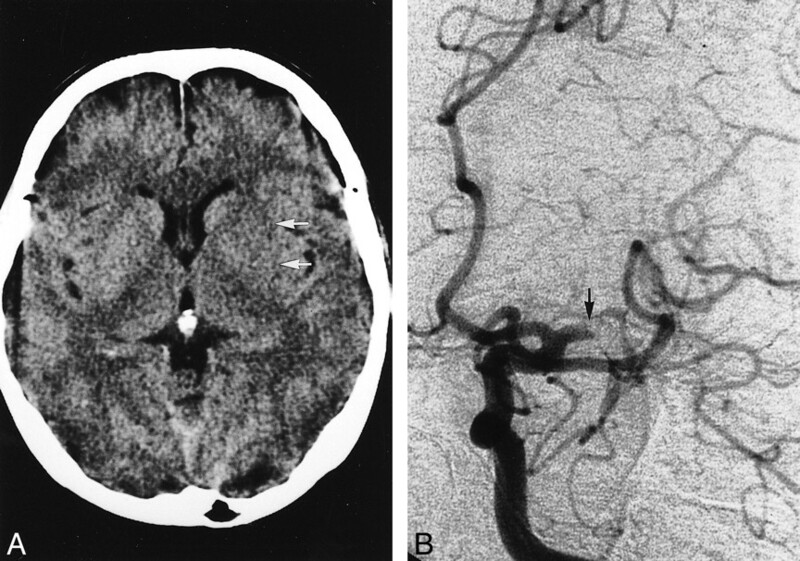 Site of arterial occlusion and lenticulostriate artery involvement were confirmed by cerebral angiography, which was performed immediately after the initial CT scanning. Complete recanalization was also confirmed in all patients by posttherapeutic angiography or follow-up MR angiography. Initial CT images were retrospectively analyzed by thee neurosurgeons (S.N., T.Is., T.Y.) trained for the diagnosis of early CT signs. The purpose of this study was not to evaluate the detection rate of early CT signs by blinded reading, but to investigate the incidence of parenchymal hypodensity within 3 hours after various types of embolic MCA occlusion. Furthermore, we assessed the correlation of subtle hypodensity in the deep MCA territories and involvement of the lenticulostriate arteries in ischemia. Therefore, to minimize false-negative or false-positive interpretation, all readers knew clinical features, and early CT signs were determined by consensus. Early CT signs were defined according to the following characteristics: obscuration of the margin of the lentiform nucleus, loss of the insular ribbon, and cortical effacement (6, 7). Early CT signs in the deep MCA territories were divided into the following three grades according to their anatomic extent: 1) grade I, normal basal ganglia, with subtle hypodensity localized to the insula; 2) grade II, partial obscuration of the posterolateral part of the putamen; and 3) grade III, hypodensity of the entire lentiform nucleus. Grade I indicated absent lenticulostriate artery involvement, whereas grades II and III indicated lenticulostriate artery involvement. Sites of arterial occlusion were divided into four types: 1) type 1, MCA trunk occlusion at its origin; 2) type 2, MCA trunk occlusion with partial involvement of the lenticulostriate arteries; 3) type 3, MCA trunk occlusion distal to the lenticulostriate arteries; and 4) type 4, M2 occlusion. The incidence of parenchymal hypodensity in each type of MCA occlusion and correlation of early CT signs in the deep MCA territories with angiographic sites of arterial occlusion were retrospectively reviewed. The rate of therapeutic recanalization and the incidence of symptomatic hemorrhagic complication in each early CT sign grade were also investigated. Statistical analyses were performed using the Mann-Whitney U test or Kruscal-Wallis test. We chose a value of P=.01 as a level of statistical significance. The initial CT study was performed 30 minutes to 3 hours (mean, 101 ± 51 minutes) after symptom onset. Initial CT scan was performed during the first hour after symptom onset in 17 patients (34%), during the second hour in 17 (34%), and during the third hour in 16 (32%). Twenty-nine patients were male and 21 were female, with ages ranging from 46 to 86 years (mean, 69.4 ± 10.0 years). Thirty-two patients (64%) had MCA trunk occlusion (eight, type 1; 18, type 2; six, type 3) and the other 18 (36%) had M2 occlusion (type 4). Early CT signs determined at varying intervals after symptom onset are shown in Table 1. Among the 50 patients, 38 (76%) had early CT signs in the deep MCA territories, whereas only 10 (20%) had cortical effacement. There was a significant difference in the incidence of early CT signs between the superficial and deep MCA territories (Mann-Whitney U test, P< .0001). Eight patients (16%) had neither early CT signs in the deep MCA territories nor cortical effacement. Among these eight patients without any early CT signs, six underwent the initial CT scan within 1 hour after symptom onset and the other two did during the second hour. Half of them had type 4 occlusion, three had type 2 occlusion, and the other patient had type 1 occlusion. The incidence of early CT signs increased with time in both the deep and superficial MCA territories. All CT scans performed during the third hour after onset showed some degree or extent of hypodensity in either deep or superficial MCA territories. Grades of early CT signs in the deep MCA territories at varying sites of MCA occlusion are shown in Table 2. Most of the grade I CT signs (13/15 [86.7%]) resulted from type 3 or type 4 MCA occlusion (Fig 1). The other two patients with a grade I CT sign had type 1 occlusion; their initial CT scans were obtained within 1 hour after symptom onset. In contrast, all four patients with a grade III CT sign had type 1 MCA occlusion (Fig 2). Although grade II CT signs resulted from various types of MCA occlusions, most (14/19 [73.7%]) were type 2 MCA occlusion (Fig 3). Four (21.1%) of the 19 patients with a grade II CT sign had type 4 MCA occlusion. All of these four patients had a short MCA trunk, and the lateral group of the lenticulostriate arteries arose from the M2 segment. The remaining one patient, whose CT scan was obtained 2.3 hours after symptom onset and who had a grade II CT sign, had type 1 occlusion. Representative early CT sign of grade I occlusion. A, Nonenhanced CT scan in a 71-year-old man obtained 1.5 hours after left MCA stroke. Note loss of the left insular ribbon (arrows) versus normal right insular ribbon (arrowheads). The left lentiform nucleus appears normal. B, Left carotid angiogram, obtained immediately after initial CT scanning, shows an embolic occlusion of the left M2 segment (arrow). Lateral lenticulostriate arteries (arrowheads) were well opacified from their origins. Representative early CT sign of grade III occlusion. A, Nonenhanced CT scan in a 60-year-old woman obtained 2 hours after left MCA stroke. Note obscuration of the left entire lentiform nucleus (arrows). B, Left carotid angiogram, obtained immediately after initial CT scanning, shows left MCA trunk occlusion at it origin (arrow). None of the lenticulostriate arteries were opacified. Representative early CT sign of grade II occlusion. A, Nonenhanced CT scan in a 57-year-old woman obtained 3 hours after left MCA stroke. Note obscuration of posterolateral part of the left lentiform nucleus (arrow). B, Left local angiogram, obtained using a microcatheter, shows left MCA trunk occlusion with partial opacification of the lenticulostriate arteries (arrows). The incidence of early CT signs in the deep MCA territories in each type of MCA occlusion is also shown in Table 2. There was no significant difference in the incidence of early CT signs in each type of occlusion (Kruscal-Wallis test, P = .66). Among eight patients with type 1 occlusion, seven had early CT signs in the deep MCA territories, four of which were grade III. In the other three patients (42.9%), the extent of hypodensity was restricted to a part of the insula or the putamen (grade I and II) probably because of the very early timing of CT scanning. On the other hand, type 2 and 3 occlusions always resulted in grade II and I CT signs, respectively. Two thirds (8/12 [66.7%]) of early CT signs induced by M2 occlusion were grade I; the remainder (4/12 [33.3%]) were grade II. The sensitivity and specificity of grade II and III CT signs as positive for lenticulostriate artery involvement were 77% and 100%, respectively. On the other hand, the sensitivity and specificity of a grade I CT sign as negative for lenticulostriate involvement were 65% and 87%, respectively (Table 3). The rate of therapeutic recanalization and the incidence of symptomatic hemorrhagic complication in each grade of early CT signs are shown in Table 4. The rates of therapeutic recanalization were 66.7% in patients without early CT signs in the deep MCA territories, 73.3% in patients with grade I CT signs, 78.9% in patients with grade II CT signs, and 75.0% in patients with grade III CT signs. There was no significant difference among these recanalization rates (Kruscal-Wallis test, P = .90). On the other hand, the rate of symptomatic hemorrhagic complications showed a tendency to increase as the grade of early CT signs increased, although a statistically significant difference was not proved (Kruscal-Wallis test, P = .37). None of the patients without early CT signs in the deep MCA territories had symptomatic hemorrhagic complication, whereas one (6.7%) of 15 patients with grade I, three (15.8%) of 19 with grade II, and one (25.0%) of four with grade III CT signs had symptomatic hemorrhagic complications. Because superficial MCA territories have collateral networks, and cortical effacement is a reflection of extracellular vasogenic edema, which is subsequent to intracellular cytotoxic edema, cortical effacement is usually seen 3 hours or more after onset of ischemia (6). Our present study has also demonstrated that only 10 (20%) of 50 patients had cortical effacement when early CT sign evaluation was restricted to the initial CT images obtained within 3 hours after symptom onset. On the other hand, early CT signs in the deep MCA territories, which are reflections of intracellular edema in the very early stage of ischemia, were seen in 38 (76%) of 50 patients during the first 3 hours after onset. Furthermore, early CT signs in the deep MCA territories are seen as early as 1 hour after symptom onset. In our study, 10 (58.8%) of 17 patients whose initial CT images were obtained within 1 hour of symptom onset had early CT signs in the deep MCA territories. The lentiform nucleus seems extremely sensitive to ischemia, because the lenticulostriate arteries are terminal vessels with poor collaterals (7–9). The insular cortex is also sensitive, because it is the region most distant from the potential collateral flow from the anterior and posterior artery distributions (7, 9, 10). Therefore, in patients with angiographically proved MCA trunk occlusion, the incidence of early CT signs has been reported to increase up to 100% during the first 2 hours after symptom onset (8). Our study has also demonstrated that, regardless of the type of MCA occlusion, all CT scans obtained during the third hour of onset showed some degree or extent of hypoattenuation in either deep or superficial MCA territories. Although the positive rate of subtle early CT signs in our study is relatively high because of the reader's awareness of clinical features and consensus-based CT interpretation, this approach realistically mirrors daily clinical practice. Furthermore, even without clinical information, recently trained neuroradiologists are reported to be able to assess subtle early CT signs with moderate to substantial interobserver agreement (11). Therefore, when patient selection is restricted to angiographically proved MCA occlusions, the positive rate of early CT signs may be fairly high, even within 3 hours after symptom onset. Because of such early detection of subtle ischemic CT signs in the deep MCA territories, we have little chance to treat MCA occlusion before the appearance of early CT signs. It would be better to presume that some degree of subtle early CT signs might be present in most patients with MCA occlusion. Therefore, site of arterial occlusion and involvement of the lenticulostriate arteries may be presumed, to some extent, by precise evaluation of early CT signs in the deep MCA territories. The anatomic extent of early CT signs in the deep MCA territories may depend on the location of the arterial occlusion and lenticulostriate artery involvement (2, 8). When the MCA trunk is occluded at its origin, and all of the lenticulostriate arteries are involved in ischemia (type 1 occlusion), hypodensity usually extends to the entire lentiform nucleus. Therefore, grade III CT signs were unequivocally predictive for type 1 MCA occlusion. However, type 1 occlusion did not always produce grade III CT signs. Even among patients with type 1 occlusion, when the timing of CT is very early, the extent of hypodensity may be restricted to a part of the putamen or the insula. Our present study has also demonstrated that 42.9% of type 1 occlusion with hypodensity in the deep MCA territories resulted in grade I or II CT signs. On the other hand, if the medial lenticulostriate arteries escape from ischemia, the medial part of the lentiform nucleus may be spared ischemic injury, and early CT signs may be restricted to the lateral or posterior part of the lentiform nucleus. Therefore, type 2 occlusion usually resulted in grade II CT signs. However, grade II CT signs did not always result from type 2 occlusion; 21.1% of patients with grade II CT signs had type 4 occlusion. When the MCA trunk is short, the lateral group of the lenticulostriate arteries may arise from the M2 segment (2, 12). In such cases, type 4 occlusion may also involve the lateral or posterior part of the putamen. On the other hand, because the insular region is mainly supplied by the M2 segments, only loss of the insular ribbon without obscuration of the lentiform nucleus (grade I CT sign) may be usually seen in type 3 or type 4 occlusions. Although there are few exceptions of type 1 occlusion manifesting a grade I CT sign in the very early period of ischemia, grade I CT signs are usually considered as supporting evidence of absent lenticulostriate artery involvement. The presence of early CT signs has been reported to be a predictive sign of hemorrhagic complications after reperfusion therapies (4, 5, 13–18). Our study has also demonstrated that the rate of symptomatic hemorrhagic complications showed a tendency to increase as the grade of early CT signs increased, although a statically significant difference was not proved. A grade III CT sign may be a predictive sign for hemorrhagic complications after reperfusion therapy. In contrast, the presence of a grade I CT sign may not contraindicate reperfusion therapy. Even within 3 hours after onset of ischemia, involvement of the lenticulostriate arteries may be presumed by precise evaluation of subtle hypodensity in the deep MCA territories. Although the sensitivity of these early CT signs for lenticulostriate artery involvement reported herein was relatively low (≈70%), specificity was very high. When grade I CT signs were present, there was little possibility of the involvement of the lenticulostriate arteries in ischemia. In contrast, when grade III CT signs were present, all of the lenticulostriate arteries were involved in ischemia. 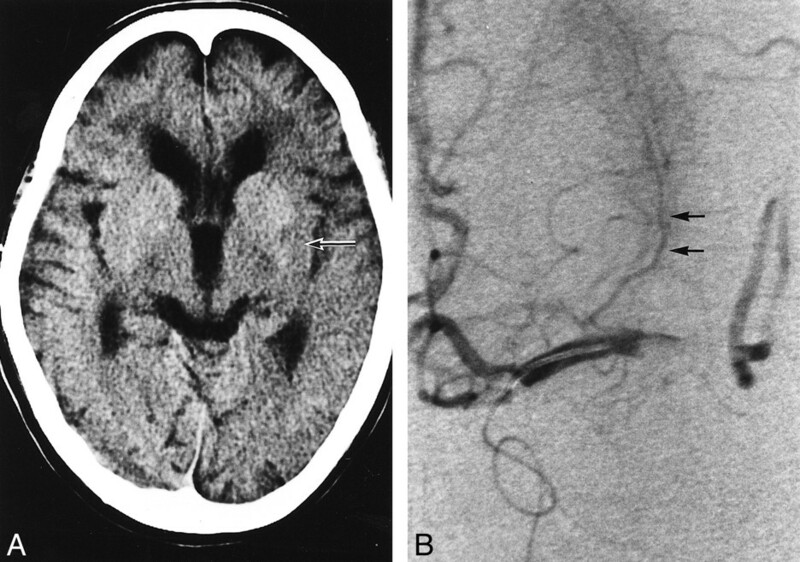 Although a grade II CT sign resulted from various types of MCA occlusion, it was reliably predictive for the presence of partial, or sometimes total, involvement of the lenticulostriate arteries in ischemia. ↵1 Address reprint requests to Shinichi Nakano, M.D., Department of Neurosurgery, Miyazaki Medical College, 5200, Kihara, Kiyotake, Miyazaki 889-1692, Japan.